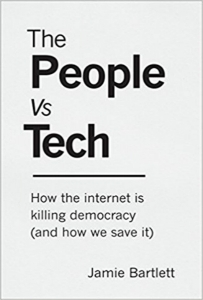 In The People vs Tech: How the Internet is Killing Democracy (and How We Can Save It), Jamie Bartlett offers an incisive account of the key challenges that Western democracy faces in light of the growing power of technology companies, presented alongside twenty suggestions for how to save it. While it could attend more to the role of capitalism in fostering such behaviour, the book will help readers formulate the questions that need to be asked of the technology surrounding us, recommends Kevin Seidler. Technology firms have long been run under a simple rule: scale fast, ask questions later. Over the last thirty years, giddy start-ups have transformed into multi-billion-dollar conglomerates, with the first ever trillion-dollar firm expected to be a technology company. As power has accrued to these firms and their platforms, their business models have come under increasing scrutiny. How do they make profit? Is it right that they can use our data? And what will these companies look like in the future? In this relatively short yet incisive book, Jamie Bartlett presents us with the key challenges that Western democracy will face in light of these growing technology companies. The People vs Tech highlights his six pillars of democracy and shows how unrestricted technology corporations might weaken each of them. These pillars are: 1) Active Citizens; 2) Shared Culture; 3) Free Elections; 4) Stakeholder Equality; 5) Competitive Economy and Civic Freedom; and 6) Trust in Authority. Through interviews with key individuals, including employees from Cambridge Analytica, ex-Facebook executives and artificial intelligence start-up founders, Bartlett is able to complement his broad knowledge with first-hand experience of some of the most exciting areas emerging within the fields of technology and politics. The People vs Tech is organised into six chapters, each dealing with technology’s impacts on one of the respective pillars of democracy that Bartlett identifies. Chapter One focuses on what ‘the power of data is doing to our free will’ (11), with Chapter Two looking at the impacts of ‘information overload’ (41). Chapter Three shows us how digital analytics are changing elections in ways we don’t yet understand (69), before Chapter Four provides a realistic view on an artificial intelligence-driven jobless future (103). In the final chapters, Bartlett first addresses the modern difficulty in assigning monopoly status to technology firms (131), before discussing the risks of a ‘crypto-anarchy’ future, where crypto-currency is able to circumvent governments on a large scale. Bartlett then ends with his twenty ’Ideas to Save Democracy’ (207). Bartlett’s writing style allows a reader with no background in technology or politics to rapidly understand the most challenging and complex issues in the field. While public figures and the media seem to grasp at different strands of technology disruption without referencing any real coherent argument, Bartlett effectively manages to condense the political challenges of technology into his six-pillar framework. This book can therefore serve as both a foundational introduction to the current technological and political landscape, whilst also providing much-needed clarity to even the seasoned reader of such issues. The central claim of this book is that in the coming years, either technology will destroy democracy and the social order as we know it, or politics will stamp its authority over the digital world (1). While technology can widen the information pool and give unheard groups a platform (2), platforms such as social media ultimately hinder us from developing and evaluating our own controversial thoughts (for fear of permanent negative public appraisal), leading to the development of a ‘moral singularity’ whereby no individual really has their own views, with moral and political reasoning delegated to machines (38). Bartlett views the online world as fostering ‘tribalism’ as people can easily find grievances related to sub-groups with which they identify (49). Social media and the internet help to facilitate fast, instinctive and emotional thinking rather than slow, logical and rational thought processes (51). As unvetted, visceral, emotional and sometimes fake content is rapidly shared, Bartlett believes it is more likely that populist, autocratic leaders can claim to help alleviate resulting concerns. While he acknowledges that the negative components here are mainly human psychological traits, Bartlett argues that big technology companies have made these weaknesses a structural feature of how they make money (60). As Bartlett highlights in fascinating detail, social media played a dramatic role in the shock election of Donald Trump. The techniques in play here were enabled by controversial, and sometimes illegal, methods of online data collection, and Bartlett is able to provide key insight into how the now-disgraced Cambridge Analytica played a central role in targeting voters for the 2016 US elections. On data collection, Bartlett’s main concern is that personalised advertising removes the possibility for a common discourse in political elections, as each individual receives their own segmented message (85). With the rise of Russian bots and other means of fostering disinformation on both sides of the argument, Bartlett is wary of the impact that digital marketing can have on an election campaign (94). Bartlett also tackles societal inequality by questioning the impact of artificial intelligence on the job market. His insight is that artificial intelligence risks hollowing out ‘routine cognitive’ jobs that primarily affects the middle class (181). As machines don’t demand a share of profit, a resulting decline in union power and an increased shift of earnings towards capital owners risk dramatically increasing inequality (120–21). Bartlett fears that a society with greater inequality will encourage individuals to trust each other less, leading to reduced innovation and entrepreneurship, whilst a wealthy capital-owning elite will live segregated from the poorer masses – a situation which is not ideal for either side (124). In the face of growing financial and political power, some media figures have advocated for the breaking up of Google and other such companies. Bartlett sees this view as misguided, arguing that such companies provide the benefits that they do only as single corporate entities (134). Instead, Bartlett urges us to reconsider what a modern monopoly looks like, focusing on power, data and control of public space to then enact appropriate limiting policies on that power (144). Finally, Bartlett addresses the growing field of crypto-currency by highlighting the potential political implications that might be appealed to by libertarians. ‘Crypto-anarchy’ is a growing movement that promises to rid the individual of government and provide freedom in one’s activities (173). However, Bartlett shows how this dangerous trend is in fact a renouncing of fundamental social responsibilities to others (177), highlighting that state coercion is sometimes needed to enact the laws and powers that express the will of the people, along with the protection of fundamental rights (175–76). He therefore ultimately rejects this movement, whilst suggesting that some benefits of blockchain technologies can still be utilised, for example in the keeping of medical records (175). In his following ‘Ideas to Save Democracy’, Bartlett presents twenty ideas that range from policy instruments to education recommendations and personal psychology hacks. Amongst other suggestions, Bartlett aims to break the advertising revenue model of the biggest technology firms, spread the wealth that is generated by these companies, tax robots, teach critical thinking and advocate for the individual making of political and moral decisions. Ultimately, People vs Tech contributes to the much-needed debate around how technology is impacting society and politics today. At some junctions, it is clear that Bartlett is critical of the monopolistic behaviour of these firms, and as such, it is disappointing that he does not engage more deeply with the political framework that allows for capitalism to thrive and foster such profit-seeking behaviours. While the use of our private data is a central point here, the book does not stake a claim on any potential right or wrong way for governments and firms to use and regulate it. Issues around social media remain similarly unresolved. Attempts at personalised adverts and a stream of content delivery have been structural features of society for a long time, and it is hard to see how this is normatively different with technology today. Are we underestimating the ability of humans to sort through information? Are populism and autocratic rule perhaps a reaction to years of growing inequality, a problem that technology has made more visible? Perhaps only time will tell how Bartlett’s six pillars truly play a role in the development of technology, but it is hard to argue that we should not take the claims very seriously indeed. When it comes to rapidly scaling technology companies, society must now ask the right questions – and Bartlett’s book is a strong place to start. Kevin Seidler is currently completing his MSc in Philosophy and Public Policy at the London School of Economics. As a management consultant, he has previously worked with FTSE 100 companies to introduce innovative digital technologies into their business. Once again your site has identified a book I would not have been aware of and which I will buy. But I hope it also identifies how the internet SAVED democracy at a time when the elite had effectively corralled democracy and barred diverse forces from having a say, specially at the time of the crash a decade ago. The old media (state tv and the newspapers) acted as gatekeepers to traduce, lie and smear diverse forces who had no way of getting their point across until social media gathered momentum. To this the elite added clever ways of banning diverse forces from even appearing. A case in point. In 2008 I was told by state radio and tv in the Uk (the BBC) that even though I was an elected politician on the London Assembly, I was to be banned from any tv coverage during the London |Mayor election if I stood – I was in ‘the wrong class’ of candidate. It sounds extraordinary that just a decade ago the BBC was in a position, for example, to ban UKIP from all meaningful coverage during such an election while providing millions of pounds worth of free advertorial coverage to their favoured ‘main parties’. In the interests of ‘fairness’. Plus I was told by the state acting on behalf of the elite that I was banned from writing to my constituents (cleverly constructed spending rules designed by the elite to bar diverse candidates from even writing one letter to all of their voters!). Come the age of social media which really took off for elections in the UK after this time and the elite could no longer do this – now they have to accept that alternative and diverse forces can do it without their gatekeeping, smear campaigns, and bans on coverage. The forces of liberation from the elite can use these tools to sidestep the bans and smear campaigns. Now the elite howl about it being unfair that new parties can get direct to the voter, and they try to put the lid back on the pressure cooker and want it all back the way it was when they controlled the media through their PRs and henchmen, and state money.